The newest kid on the block for researchers at the University of Saskatchewan is a world-class facility that brings together under one roof all aspects of raising livestock in a sustainable and environmentally responsible manner. The Livestock and Forage Centre of Excellence is a $38-million world-class complex of field and science laboratories, operating three distinct research and teaching units. While each focuses on certain aspects of livestock production, they are fully integrated to encourage collaboration between scientists and students from a range of disciplines. Plant, soil and animal scientists from the College of Agriculture and Bioresources, veterinarians with expertise in infectious diseases as well as in animal behaviour from the Western College of Veterinary Medicine (WCVM), and environmental engineers from the College of Engineering are leading research projects with considerable overlap, breaking down silos to work together. “This research is so complex, we can no longer research one aspect in isolation. By combining the research, you can be more effective and you are using your dollars more wisely. Ultimately, you are also getting more insight into the answers that you want,” said Kris Ringwall, who began working as the centre’s director on Nov. 1. The mandate of the research centre includes providing livestock producers and consumers with solid, research-based information on emerging issues related to beef cattle health, reproduction, nutrition, genetics, and public safety, as well as plant breeding for forage crops, grazing management, and the environment. The Livestock and Forage Centre of Excellence is a $38-million world-class complex of field and science laboratories. The Beef Cattle Research and Teaching Unit (BCRTU) and the Forage and Cow-Calf Research and Teaching Unit are located across the road from each other, south of Clavet. Two laboratories and sample preparation areas, equipped with a centrifuge, near-infrared spectroscopy machine, industrial drying ovens and sample grinders, are located at the BCRTU and will be used by researchers at both units. The beef cattle unit is a 1,500-head feedlot and houses a state-of-the-art metabolism barn with 24 stalls. Researchers will collect data on individual animals as each stall has its own manger and water bowl. Animal comfort and care were top-of-mind when the facility was designed. Each stall has a waterbed mat and the animals will access an outdoor exercise pen daily. The forage and cow-calf unit will house a herd of 300 breeding females. In addition to outdoor cattle pens, the unit has a calving barn and a cattle handling area where animals will be weighed regularly and treated as needed. The third unit is the Goodale Research Farm. It will remain at its present location, southeast of Saskatoon, and will be upgraded starting in May, 2019. In addition to 165 breeding females, the Goodale farm houses horses, bison and deer for research. “The University of Saskatchewan should be proud of this centre. This is a major thing in the world of international agriculture. It is something that we can toot our horn about,” said Ringwall, who had been the director of the North Dakota State University’s (NDSU) Dickinson Extension Centre since 1992. Ringwall, who moved from NDSU to take on this new role at the U of S, reports to the deans of both the College of Agriculture and Bioresources, and the WCVM. 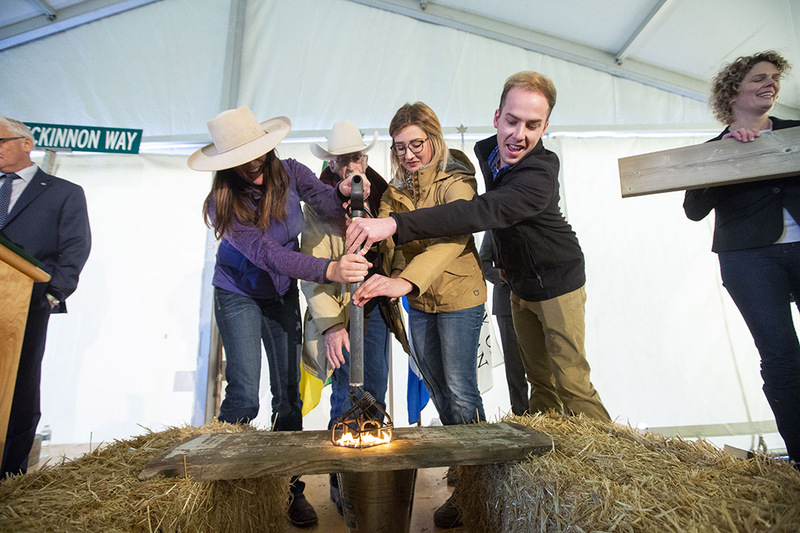 Funding for the Livestock and Forage Centre of Excellence was provided by the U of S, the federal and provincial governments, as well as several organizations, corporations and individuals. Article re-posted on Jan 10, 2019 11:27:23 AM .